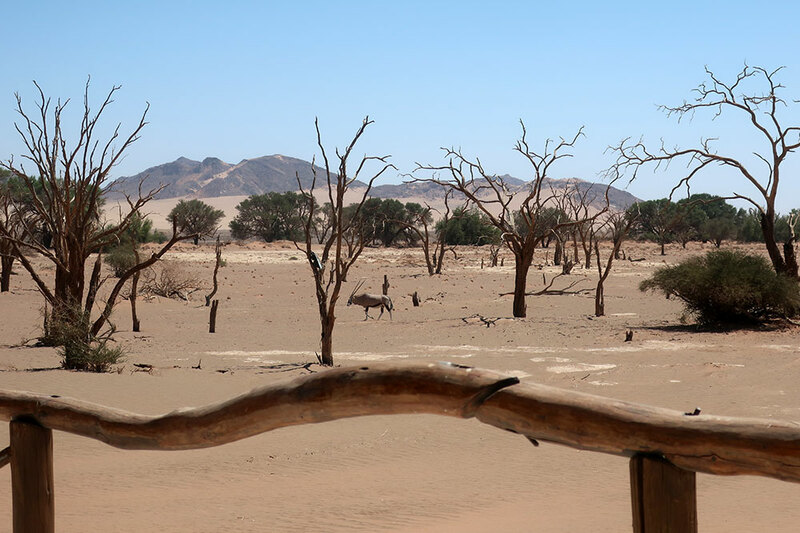 Nearly twice the size of California and with fewer than 3 million people, Namibia is one of the most sparsely populated countries on the planet. It was a great pleasure to return to a land where well-managed tourism helps sustain its sensational landscapes and unique wildlife, and the small scale and wide spacing of lodges and camps ensure that crowds are almost never a problem. 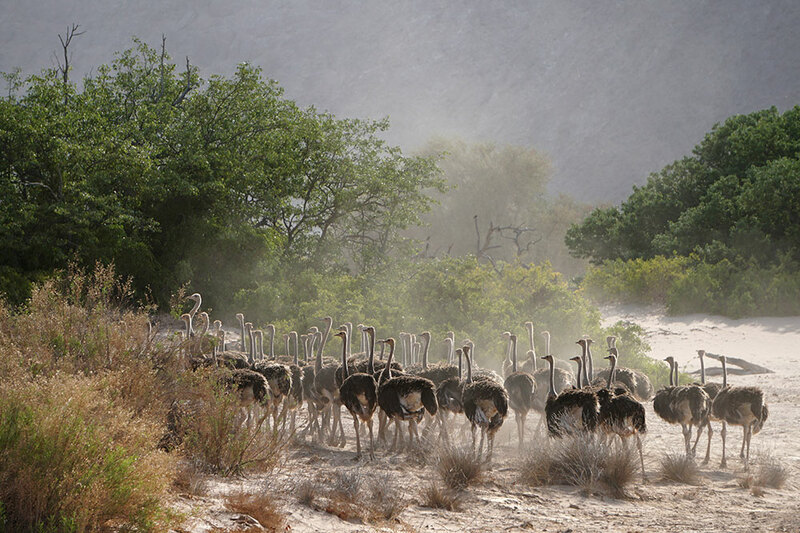 Of course, Namibia’s appeal is not limited to the absence of other travelers. 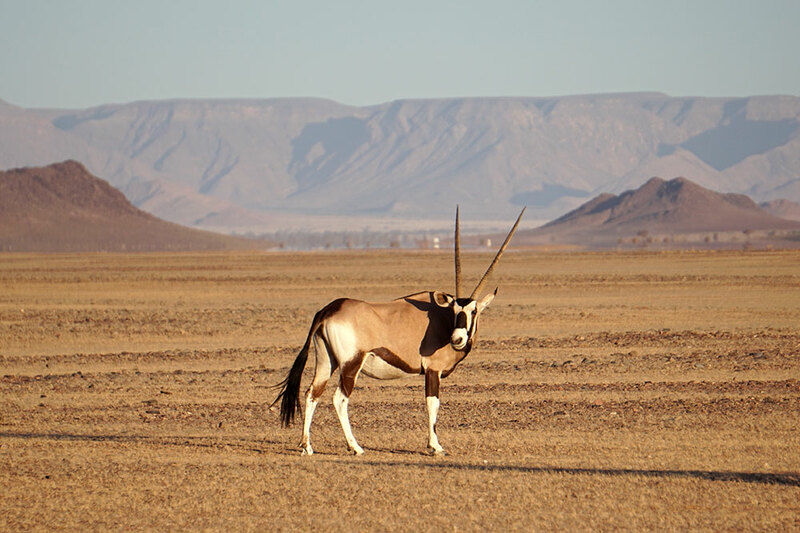 The country’s desert-adapted wildlife, including elephant, giraffe, lion and rhino, is endlessly fascinating. Some of its tribal people, most famously the Himba, maintain lifestyles unchanged by the centuries, in spite of modern pressures. 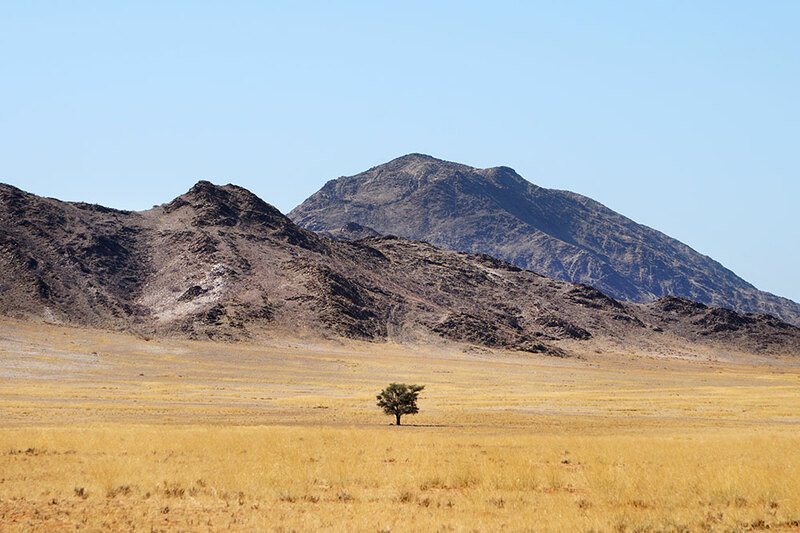 And Namibia’s varied landscapes, ranging from shattered mountains of micaceous schist to sculptural sand-dune seas, provide a breathtaking sense of desolation. At night, the moon and stars burn with startling intensity. 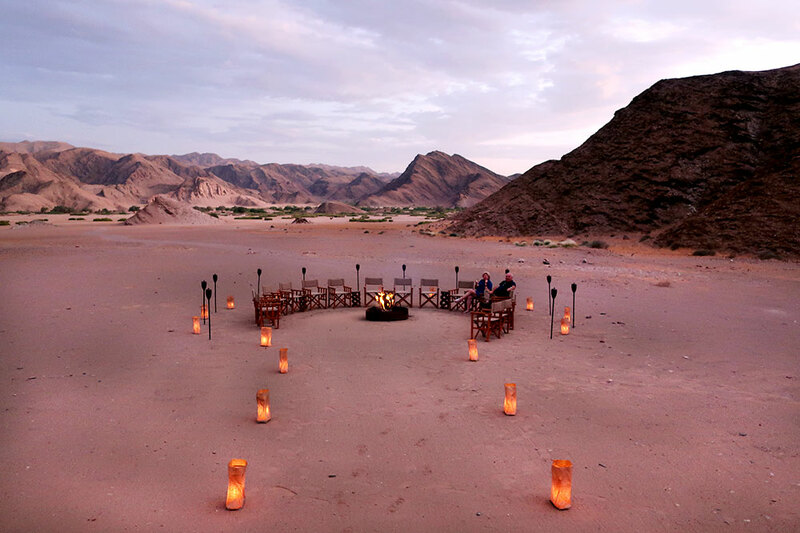 Our journey took us to the immense red dunes of Namib-Naukluft National Park, the labyrinthine canyons around the Hoanib Valley, the brooding Skeleton Coast and the relatively fertile veld near the capital of Windhoek. 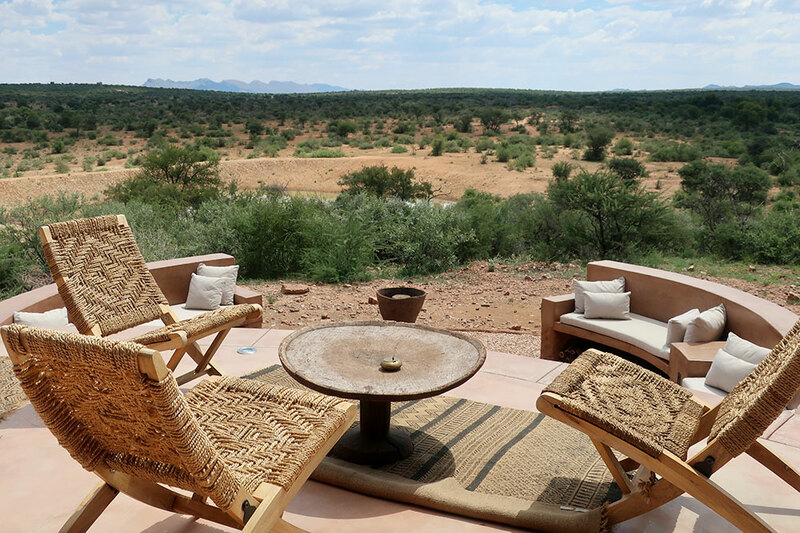 I was eager to try out two new upscale properties in Namibia’s northwest, both run by Natural Selection. 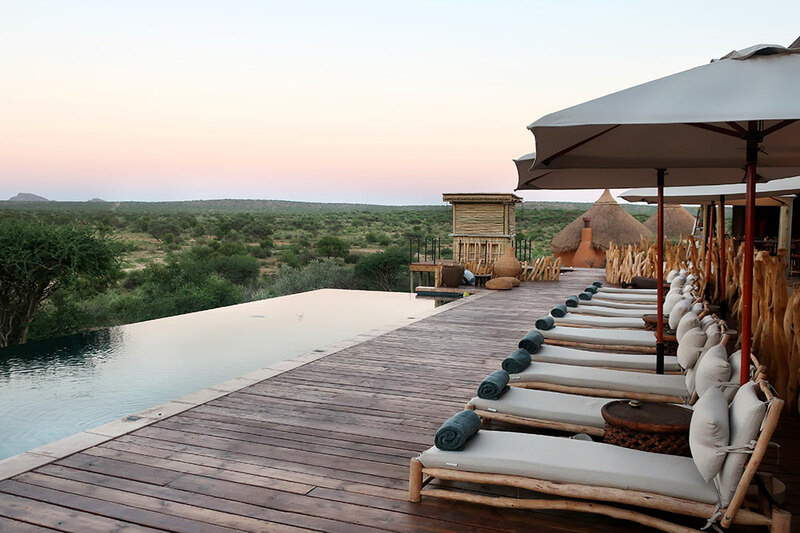 Two of this company’s founders, Colin Bell and Chris McIntyre, started the justly acclaimed Wilderness Safaris in the 1980s. 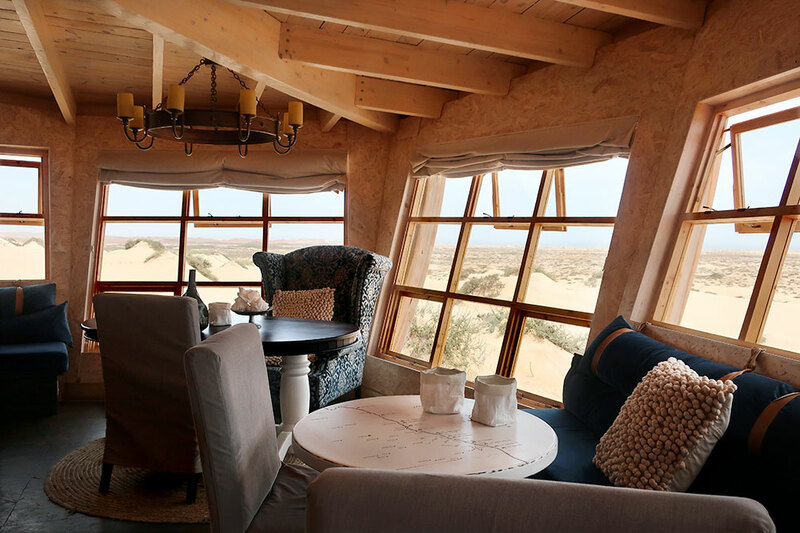 I wondered whether Hoanib Valley Camp and Shipwreck Lodge, both within striking distance of Wilderness Safaris’ excellent Hoanib Skeleton Coast Camp, deserved the many plaudits they’ve received in the travel press. Burnt-orange dune ridges veined a plain of caramel sand, until they gave way to an expanse of blasted rock riven with narrow canyons. 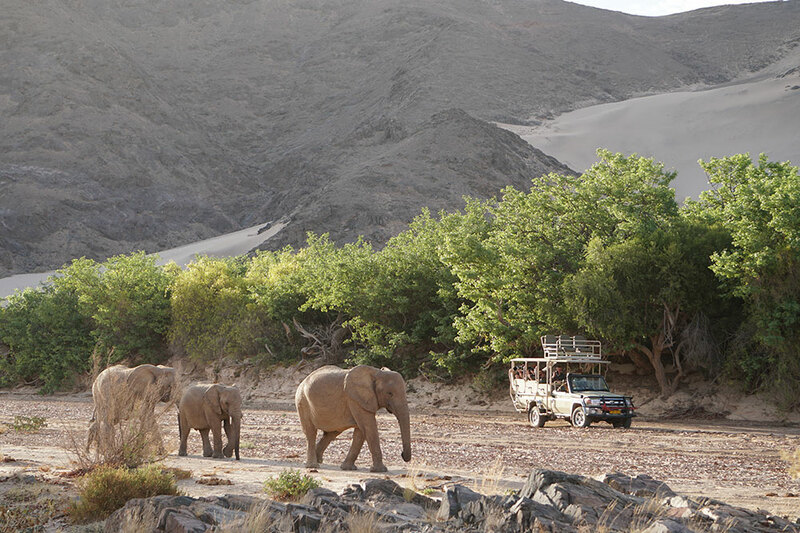 Because of Namibia’s size, the only reasonable way to reach these lodges is by air. 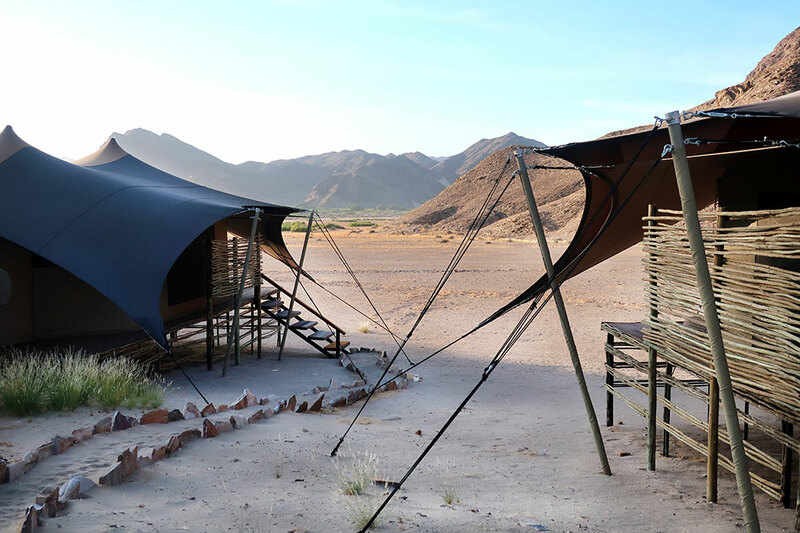 It took us three hours aboard a five-passenger Cessna 210 to fly from near the Namib-Naukluft National Park to the strip closest to Hoanib Valley Camp in Kaokoland. We spent the flight mesmerized by the landscapes passing below. Burnt-orange dune ridges veined a plain of caramel sand, until they gave way to an expanse of blasted rock riven with narrow canyons. Farther on, black mountains stood atop great fans of dry, rust-colored riverbeds. We landed at an airstrip originally constructed to access a nearby quarry. As we drove through a rolling landscape studded with stunted mopane trees, it took me a moment to realize that the white debris lining either side of the track wasn’t litter but chunks of marble. After a picturesque two-hour drive, we came to the dramatic entrance to the camp. Several staff members awaited us, singing a welcome song and bearing iced teas. These we sipped in the shade of the main communal tent. A terrace provided views of the ridge on the far side of the valley, which sported an improbable fringe of green where hardy vegetation had managed to find water. Cooled by a breeze, we lunched on California-style wraps of chicken, mixed vegetables, avocado and sweet soy sauce before retiring to our tent for the afternoon. 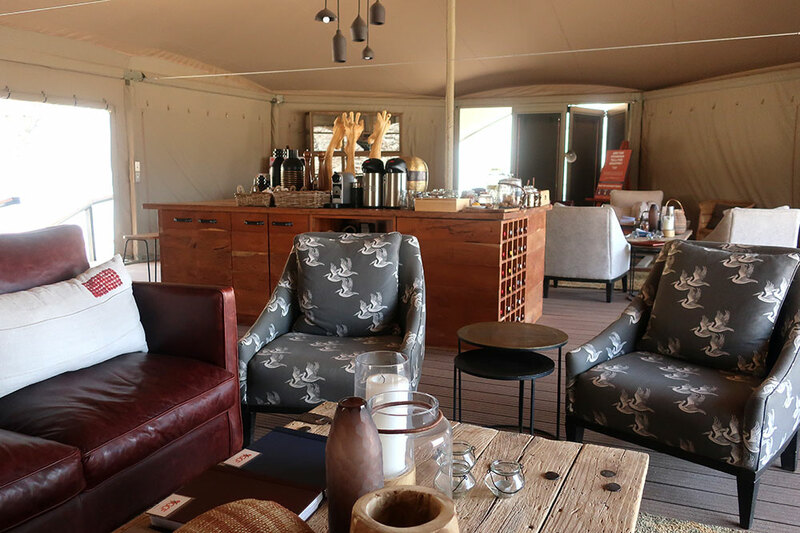 Five of Hoanib Valley Camp’s six tents resemble the one we stayed in, decorated in a simple but striking style, with wooden furnishings by local Rundu carpenters, black metal light fixtures and soft dove-gray fabrics. 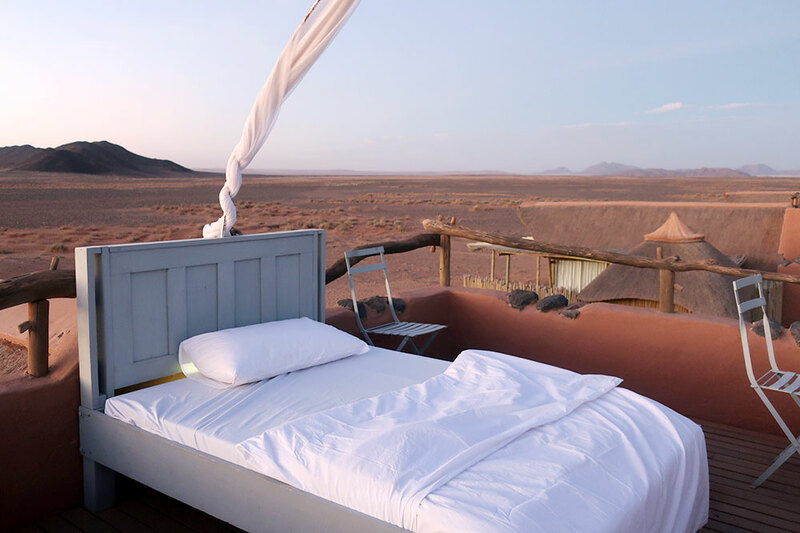 A terrace with two wood-and-canvas folding chairs stood on one side of the bedroom; behind the bed was a full bath with dual vanities and an open wood-floored shower (this being the desert, there was no tub). 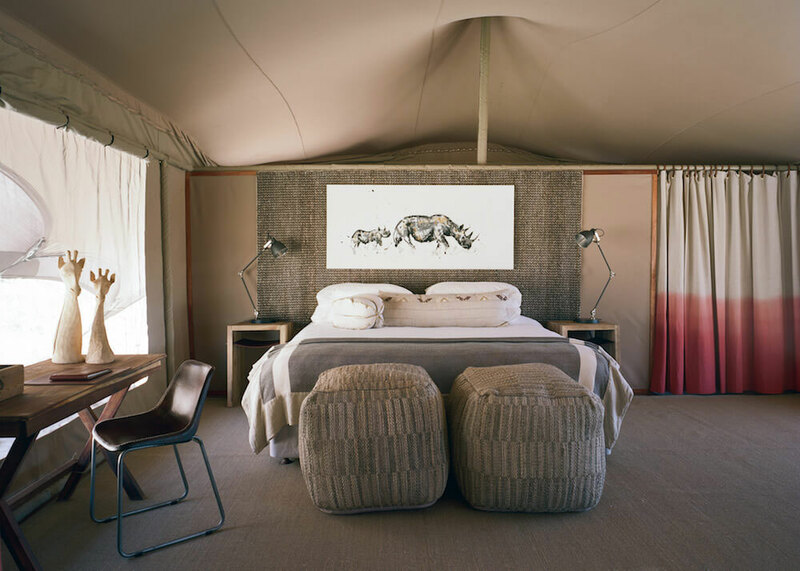 One larger family tent has an additional interior lounge. The solar-powered camp does not have air-conditioning, but we had ample electricity and hot water. The Wi-Fi didn’t reach our accommodation at the camp’s edge, but in the communal tent, it was fast enough to make phone calls. 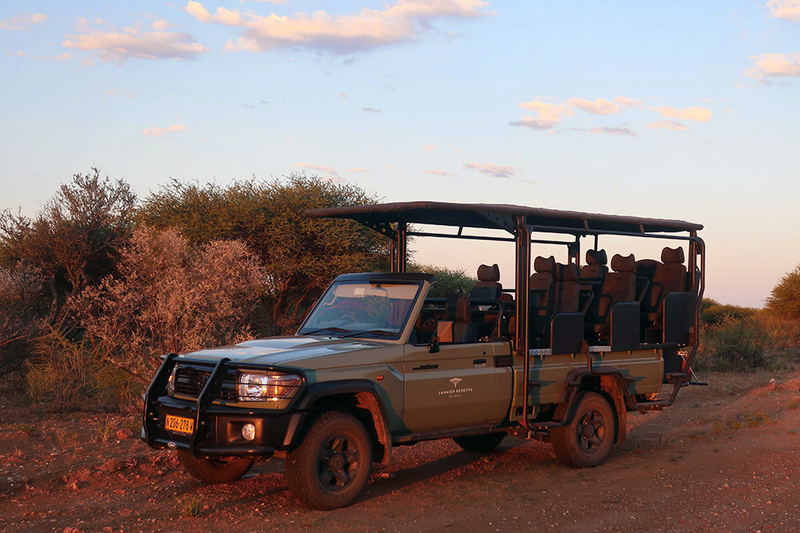 We fell into the standard safari routine, rising early for a dawn game drive, napping after a lunch back at the camp and heading out again in the evening for another game drive and sundowners before dinner. The afternoon siesta is essential in summer (December to March), when we visited. 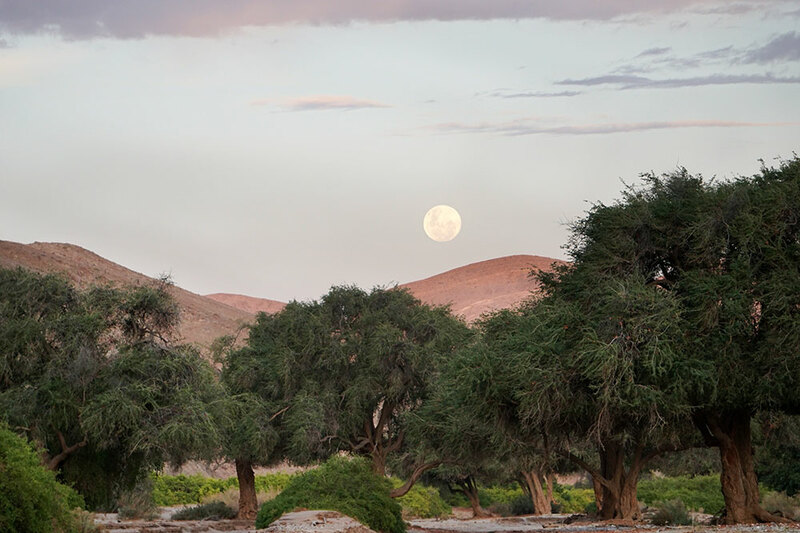 In Namibia’s winter, the sun rises later and sets earlier, and the schedule becomes more civilized. One morning, we left at 5 a.m. in search of desert-adapted rhino, the air still cold enough to warrant donning fleece-lined ponchos. Aided by two rangers, our superlative guide, Frank, found one animal in a dry riverbed about 90 minutes from camp. 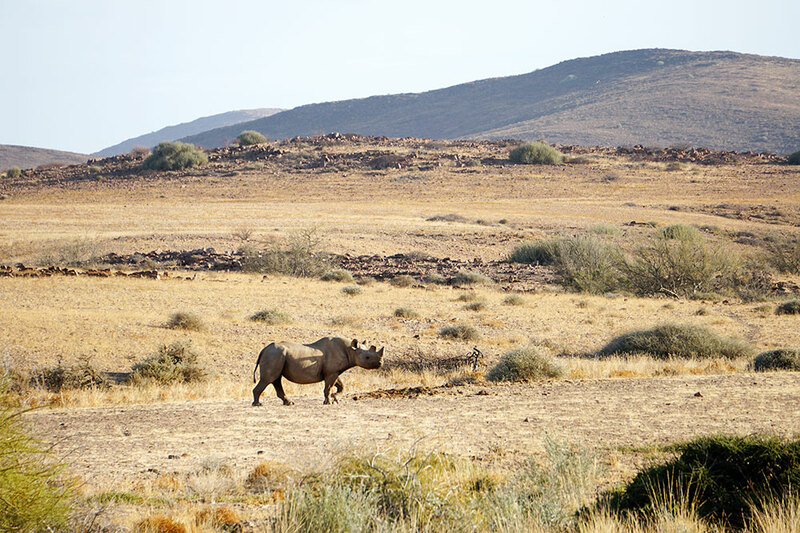 Hoanib’s rhino are some of the last to remain unfenced, and we watched raptly as it munched a leafy breakfast. Its contentment was interrupted only when it caught our scent; it trotted away with impressive dignity. 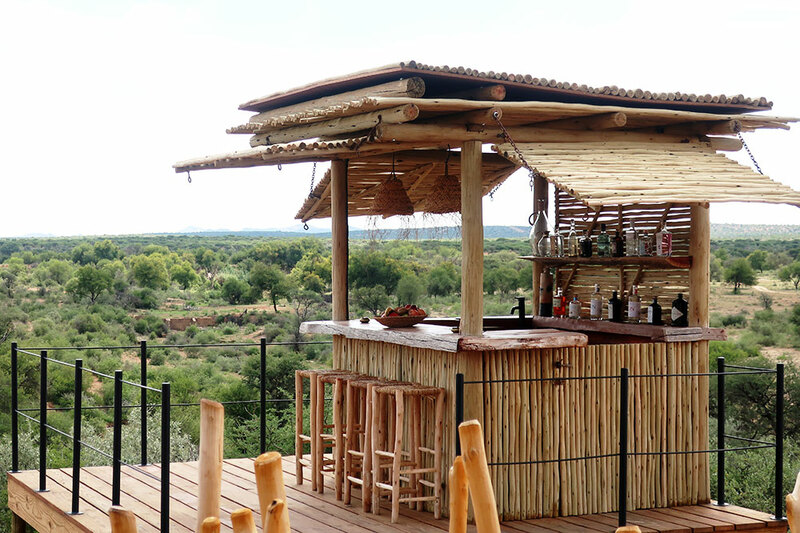 As much time as one spends with a guide, the heart of a safari lodge is often its waitstaff. And Hoanib Valley Camp is extremely fortunate in Winnie, who served us with great zest and humor along with impressive professionalism. The food she brought to the communal dining table was delicious, if not the height of sophistication. I especially enjoyed the hearty lentil soup, the beef tenderloin-like oryx in red wine sauce, and the apple pie with raisins and homemade vanilla ice cream. But I envied a vegetarian guest’s colorful pasta as I ate some monochrome rotini in a cream sauce with bacon, while the french fries that accompanied some hake were hopelessly greasy and limp. 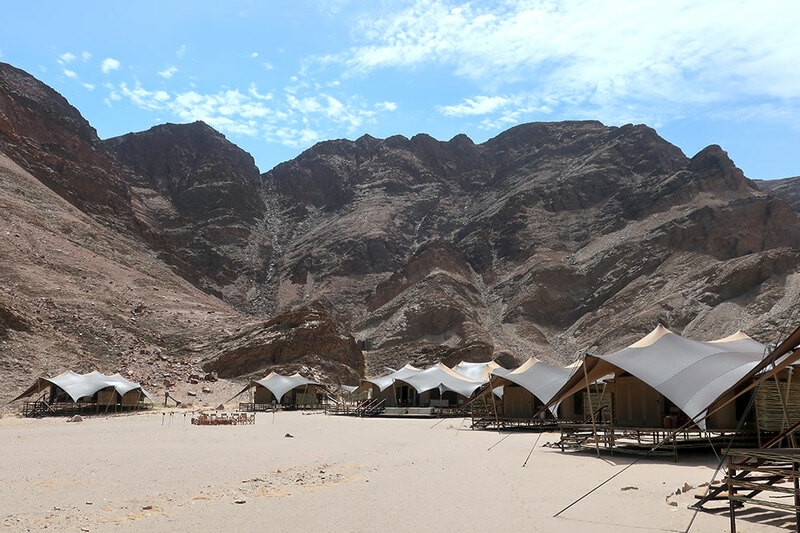 These quibbles aside, we loved our stay at Hoanib Valley Camp and left with regret. The simple and stylish campaign-style design; our superlative guide; the delightful waitstaff; the remote location; the fascinating and surprisingly lively surrounding environment; the unusually broad selection of wines by the glass. The tents have panels that unzip to reveal screens, allowing in more light and air, but they can be difficult to open and secure. 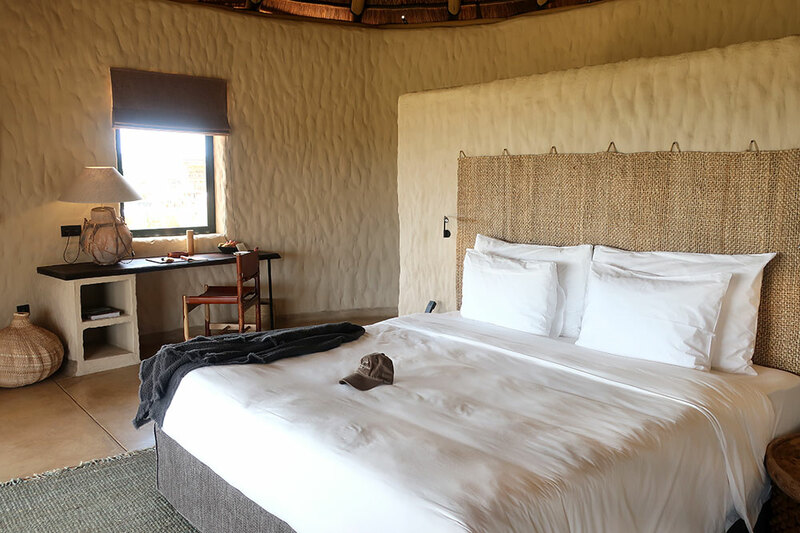 As is the case at Shipwreck Lodge and Little Kulala, the paths between the accommodations and dining room are soft sand and not well-suited to the less mobile. 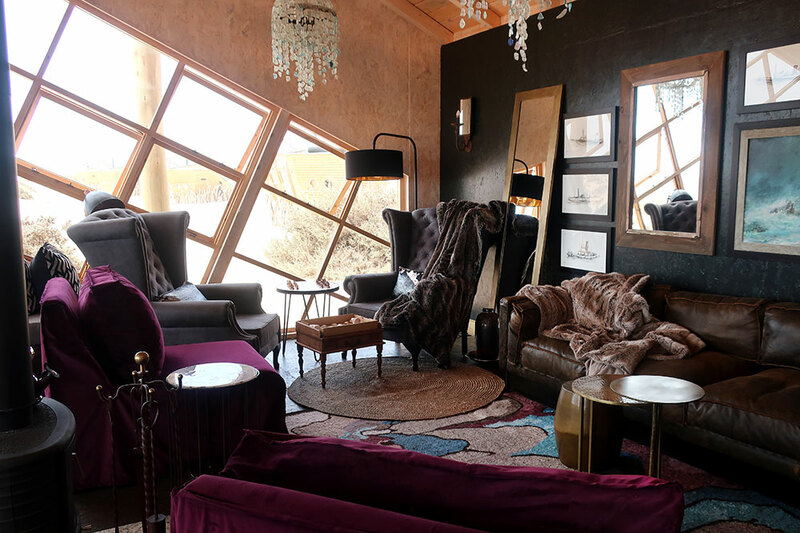 If Hoanib Valley Camp seemed remote, Shipwreck Lodge felt like the end of the world. Following barely visible tracks, our driver led us to another sandy river valley and the entrance to Skeleton Coast National Park. There, our new guide, Chris, awaited us with samosas, homemade potato chips and a chilled bottle of sparkling Cap Classique. Having bade farewell to our Hoanib Valley Camp driver, we wound our way along a parched riverbed leading to the coast. The waters off Namibia used to be whaling grounds, and skeletons of animals that had been stripped of their blubber would wash up on the beach, earning the coast its name. 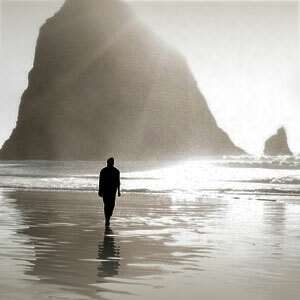 Shipwrecks, too, dot the shoreline, victims of the strong currents that sweep up from Antarctica. 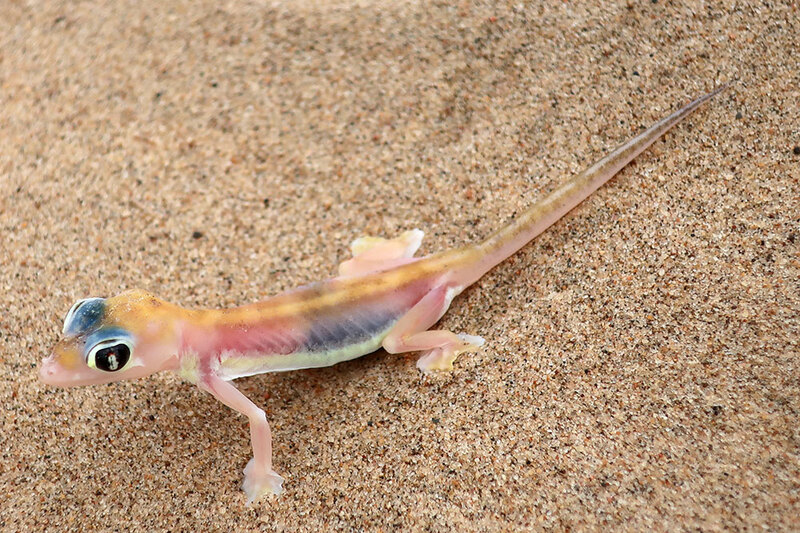 This cold water also creates the fog on which life along the Skeleton Coast depends. 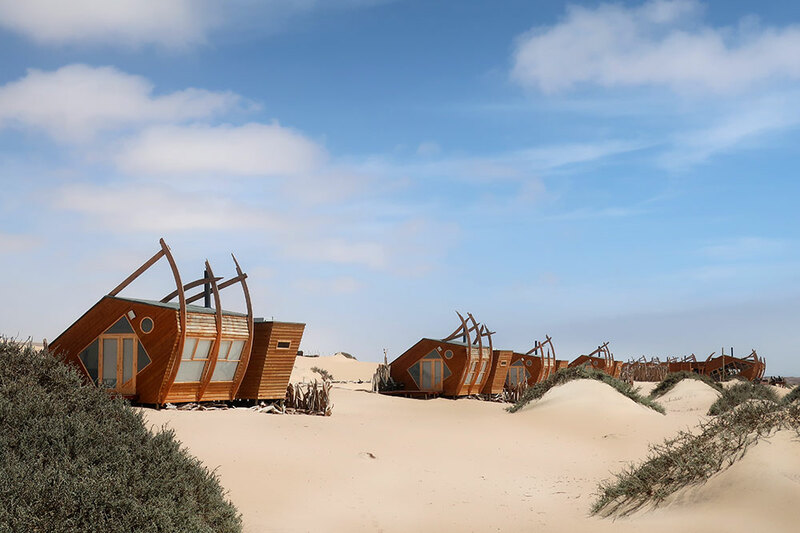 Ragged-tipped wooden ribs cradle each of the buildings at Shipwreck Lodge, making it appear as if the 10-villa property had washed up on the low dune it occupies. 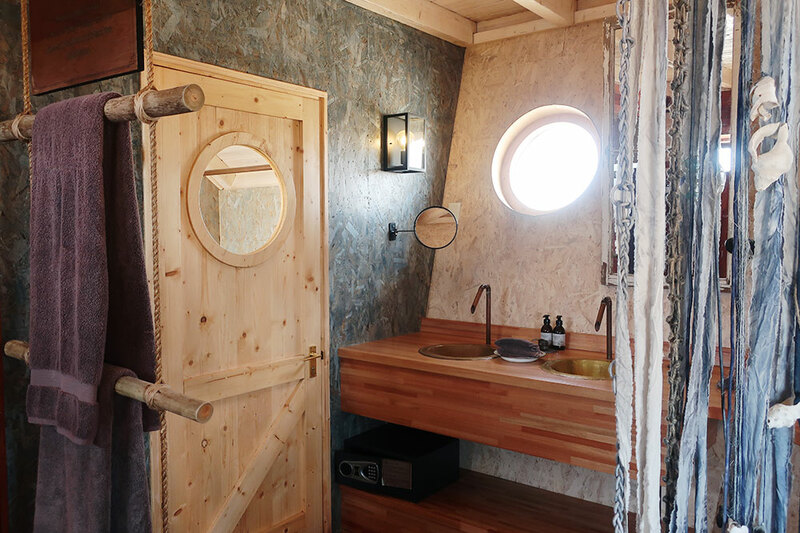 The outward-leaning walls, clad in wood siding and punctured with porthole-like windows, enhance the nautical effect. 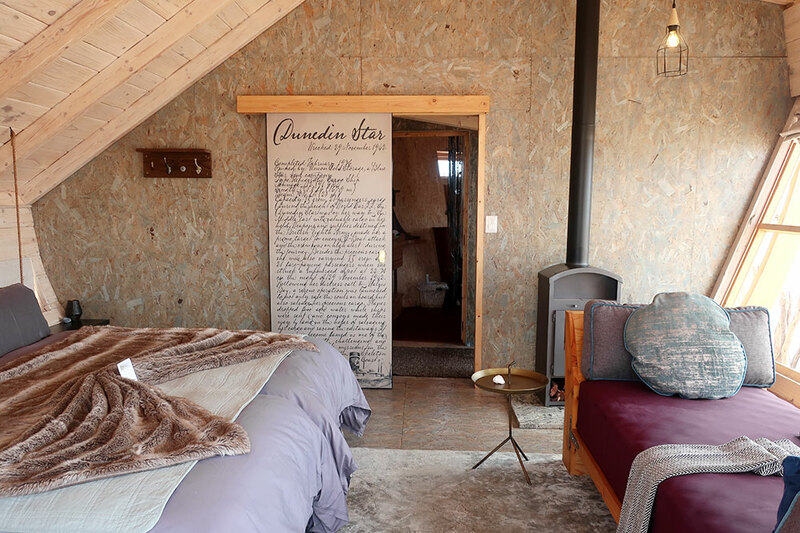 Inside, the oriented strand board paneling contrasted sharply with the luxe furnishings and décor of the main lounge and the accommodations. 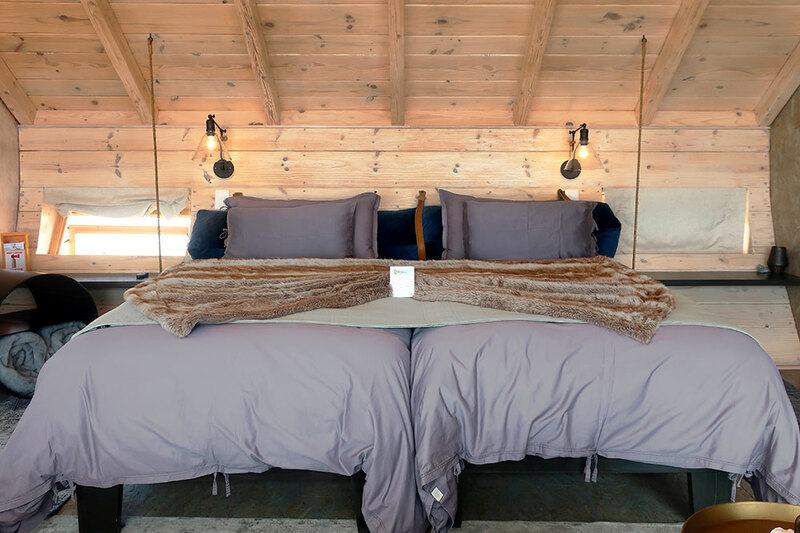 Although a great deal of care had gone into the design, with its rich textural mix of leather, linen, velvet and faux fur, at night the lighting felt too harsh, sabotaging the atmosphere. We slept with the windows open, lulled by the whisper of the distant surf. At the beach, a van was waiting for us with fishing rods, and casting from the shore, we caught three sand sharks. 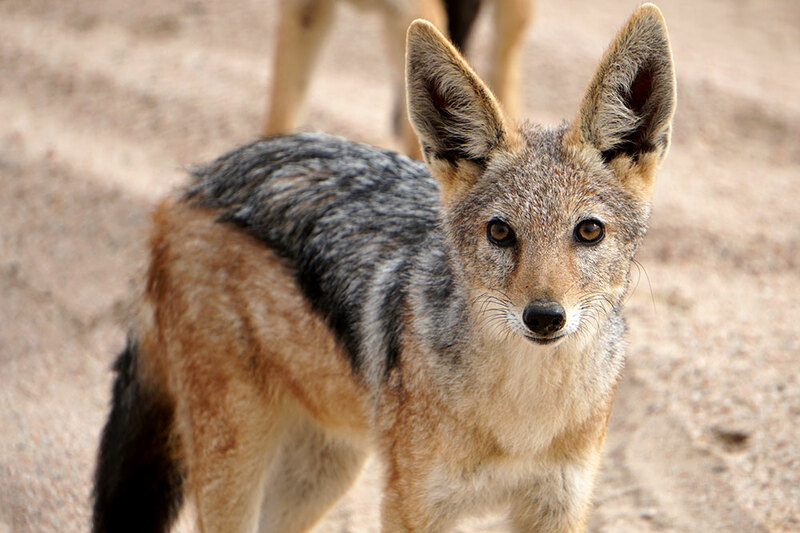 One died before we could release it and provided a fortuitous lunch for a passing jackal. We had our own beach barbecue lunch of pasta salad, lamb steaks and hake grilled in foil packets with onion and butter. 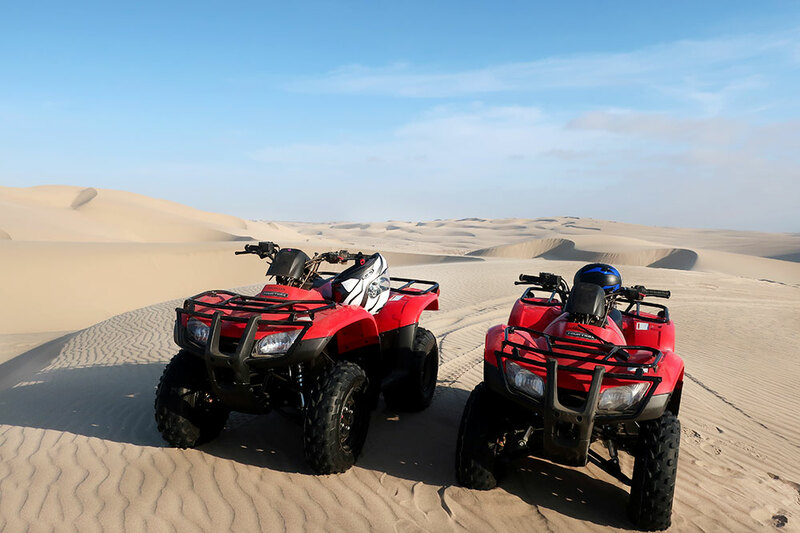 The evening brought quad biking in the sand sea and sledding on steep dunes. After a delicious dinner of sesame-crusted tuna with couscous and cauliflower, we agreed that our cheesecake dessert was well-earned. 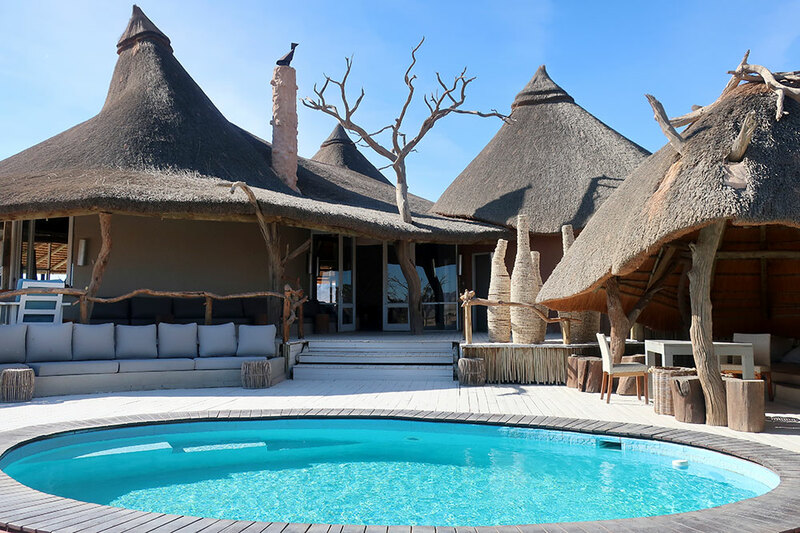 The evocative architecture; the location between dunes and the sea; our excellent guide; the memorable activities; the Skeleton Coast’s extraordinary light. 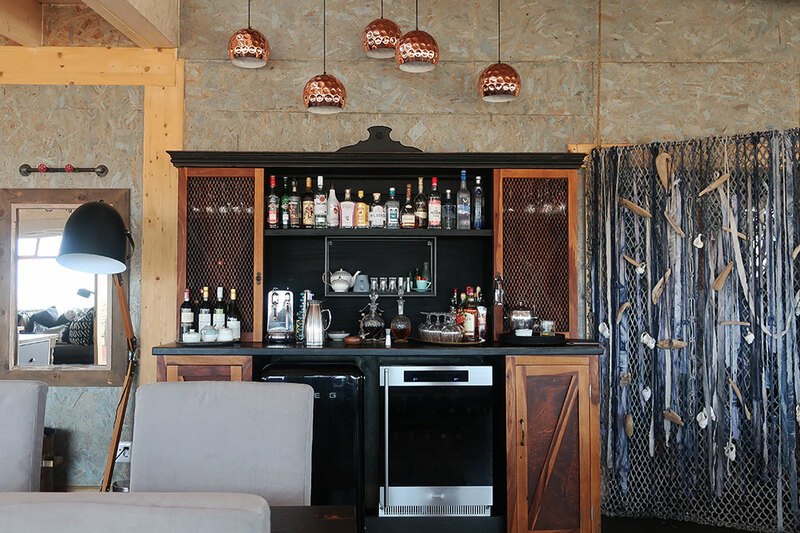 Harsh lighting detracted from the warmth of the design, and the interior paneling was not to our taste. The lion that used to come down the river valleys to the coast have been mostly killed by farmers; Etosha is a better place to see big cats. Our departure drive took us along the beach past two small shipwrecks, a boisterous seal colony and the remains of a plane that had crashed in the 1940s. We reached the airstrip just as our Cessna arrived, and a flight of a little more than two hours returned us to Windhoek. 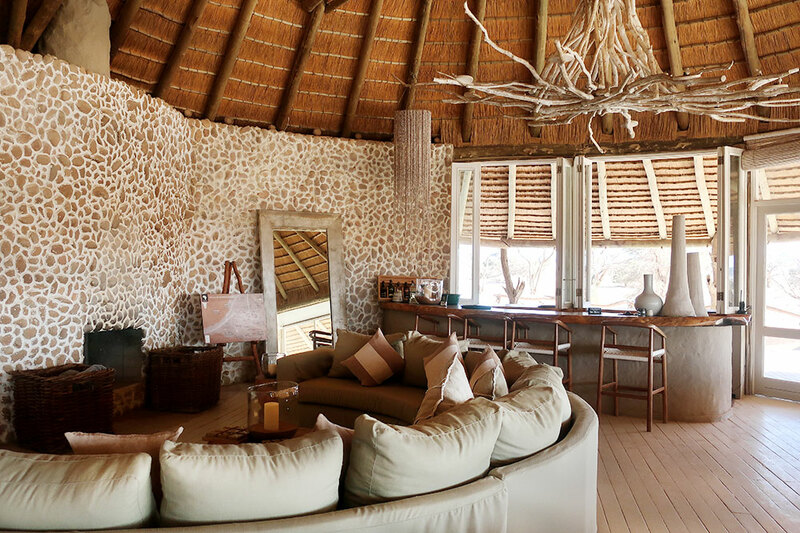 From the airport, it was just 40 minutes by road to another acclaimed new safari lodge. Omaanda belongs to a French company, Zannier Hotels. 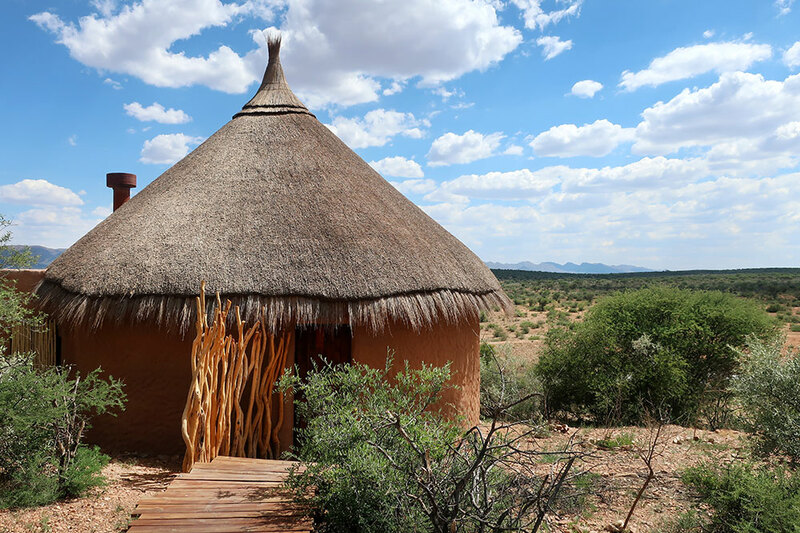 We currently recommend three other members of the group, and I was looking forward to our stay in one of the 10 guest huts immensely. Of course, the “huts” were nothing of the kind, aside from their conical thatched roofs. 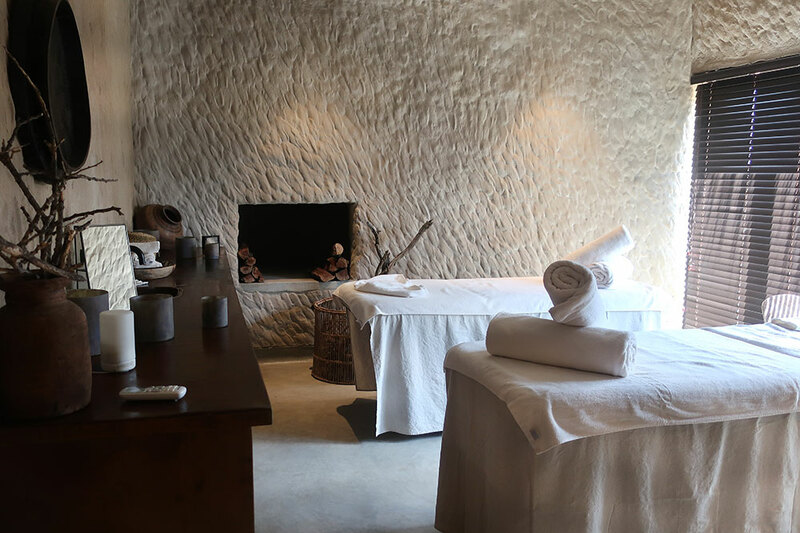 Rounded, irregular plaster walls created a handmade feel, and polished cement floors — along with effective air-conditioning — kept our one-bedroom accommodation cool, even on a summer afternoon. 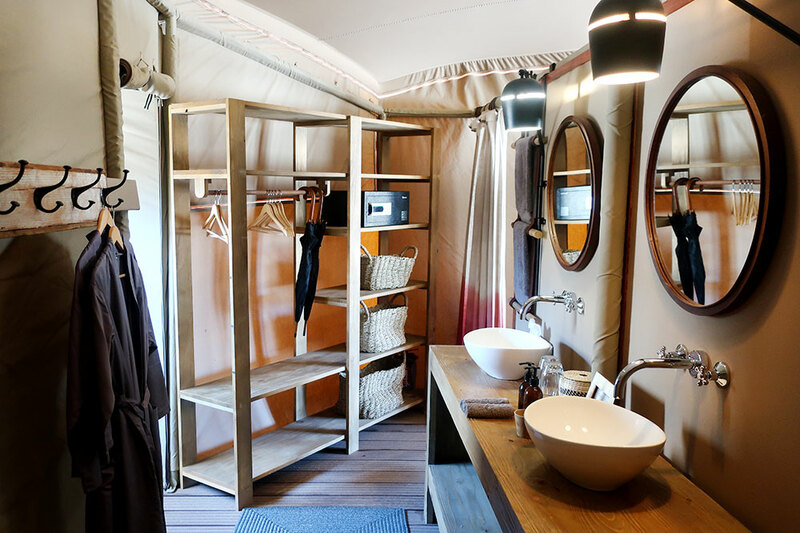 A large walk-in closet area behind the beds had ample storage space, if not enough hangers, and the bath came with dual vanities, a walk-in shower and a deep tub with a view of the property’s man-made water hole, which was also clearly visible from our shady terrace. 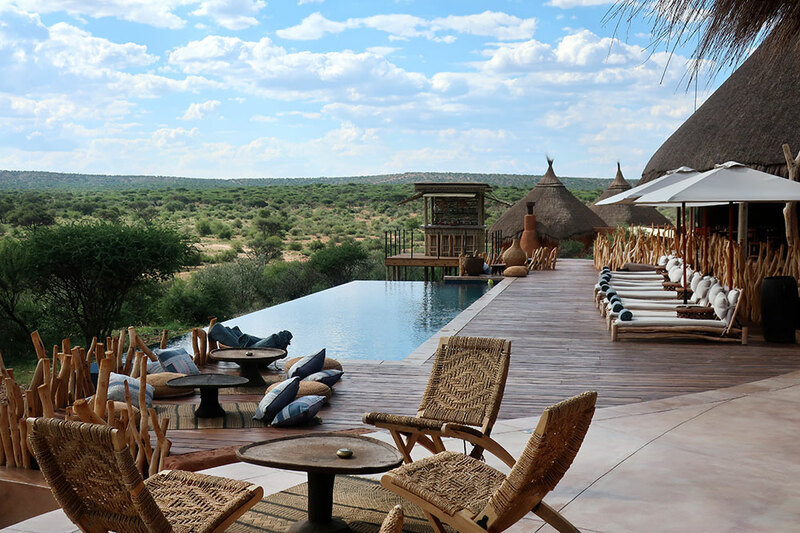 However, I preferred to watch the comings and goings of oryx and baboon from the loungers along the resort’s infinity pool or at a table in the open-air restaurant. As one might expect from a French-owned hotel, the food was very good. The sophisticated dinners were the highlight, with carefully presented dishes such as a salad of fresh green beans, peas, calamari and pickled onion; crispy-skinned sea bass with pesto; and baba au rhum for dessert. As elsewhere, the waitstaff were the soul of the property. I felt less enthusiastic about our guides, who ranged from average to absent. On our evening game drive, for example, our guide had a poor instinct for when to pause for photos of the skittish animals. 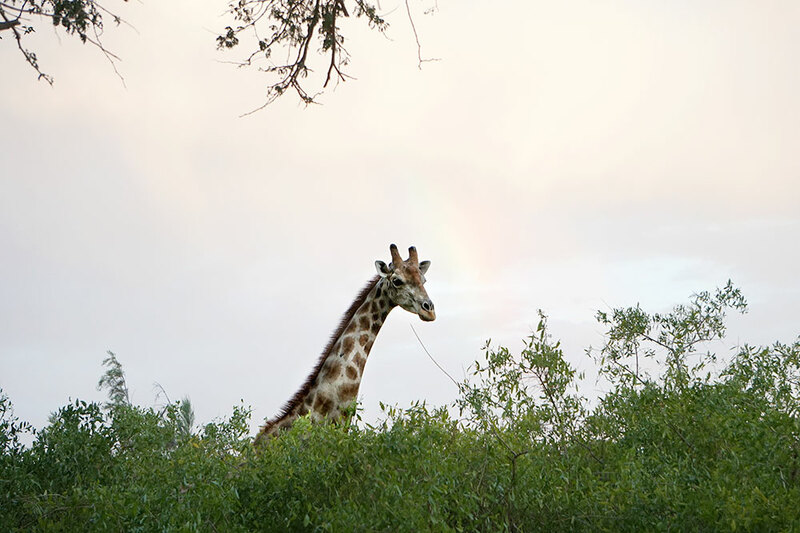 And when we stopped for sundowners, he informed us that we were in his third-favorite spot, leaving us to wonder what the other, better locations were like. Our morning excursion experience was far worse. We arrived punctually for a 6 a.m. departure, only to be told that our guide was running late. We gave him until 6:30 a.m., at which point we gave up and returned to our hut. In spite of our asking not to be disturbed even if the guide should arrive, we received an insistent knock on our door just after we had crawled back in bed. A complimentary massage provided inadequate compensation. On excursions that do proceed as planned, Omaanda takes a curious stance regarding animal photography. I understand forbidding photos of the rhino that have been relocated to the lodge’s reserve, because poachers seeing them on social media might identify their specific location. But if you take a photo of a human and an animal together, it “will result in the activity being immediately stopped!” Such photos are “detrimental to [Omaanda’s] ethics,” according to the values statement placed in the room, encouraging the erroneous impression that “a research-based sanctuary is little more than a petting zoo.” I applaud the conservation efforts of Omaanda and Zannier, but I have trouble empathizing with such sanctimonious declarations. 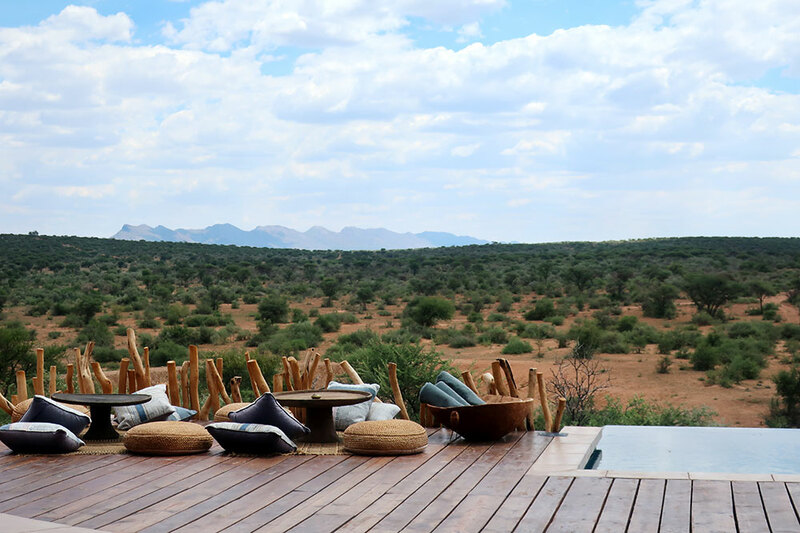 The wonderful waitstaff; the commendable cuisine; the relaxing spa; the infinity pool with a water-hole view; our close-up rhino sighting; our room’s double-sided woodburning fireplace; the property’s commitment to conservation. The failure of our early-morning excursion; the onerous photography policy; the number of flying ants, gnats, beetles and other insects that penetrated our room. Avoid Hut 2, the terrace of which lacks privacy. 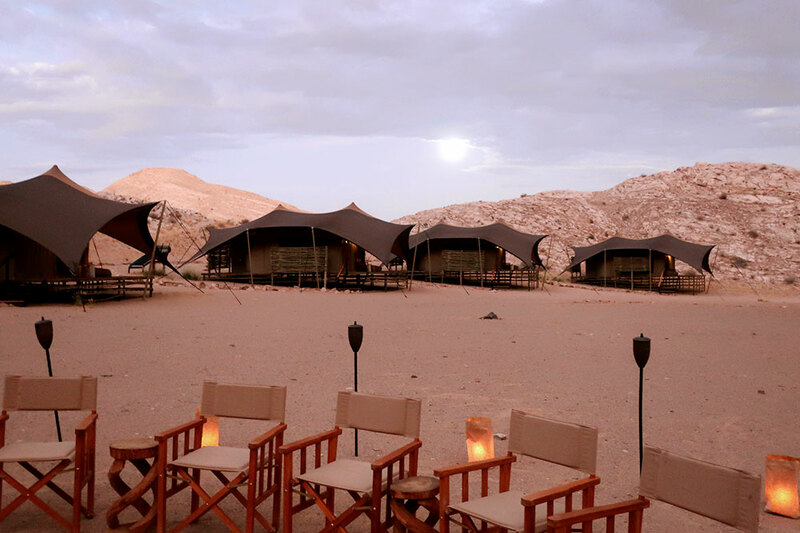 Zannier plans on opening a luxury tented camp in Namibia’s far south later in 2019. 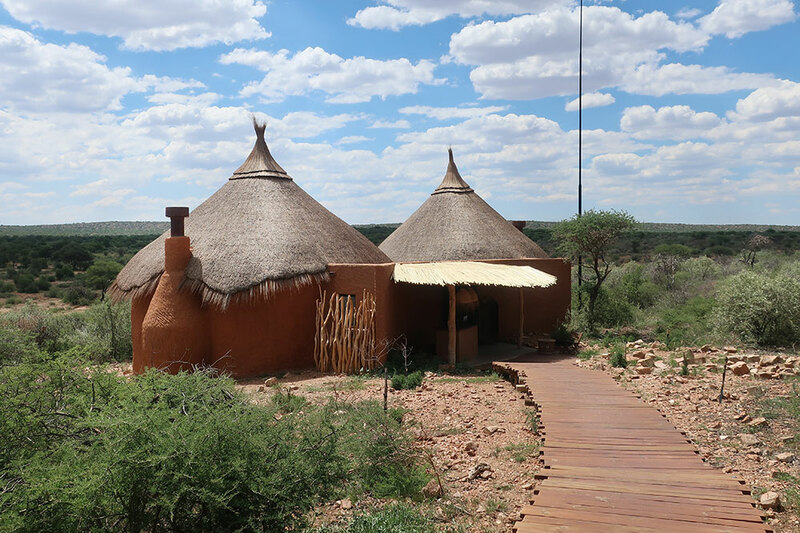 We have long recommended Little Kulala, an 11-villa lodge near the monumental red dunes of Sossusvlei, but our stay was also a mixed experience. 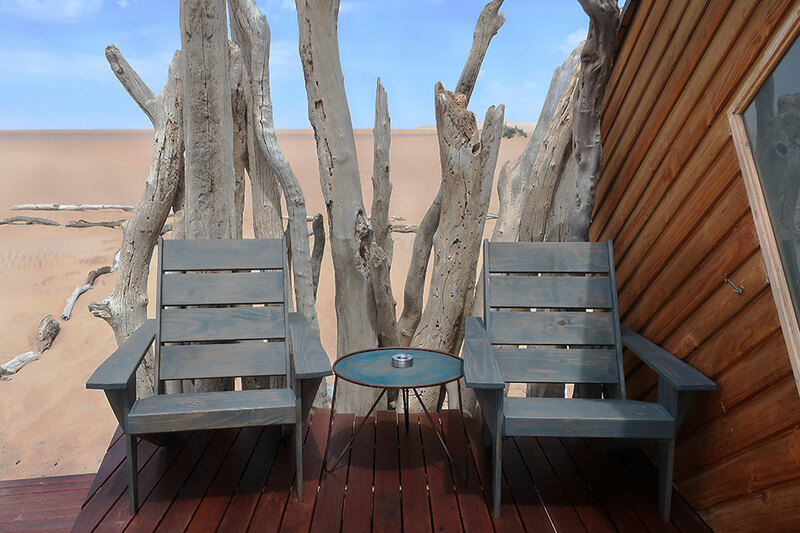 We had a fine time climbing a small dune above the iconic Deadvlei and snapping photos of the sculptural millennium-old acacia trunks dotting the white-clay pan. 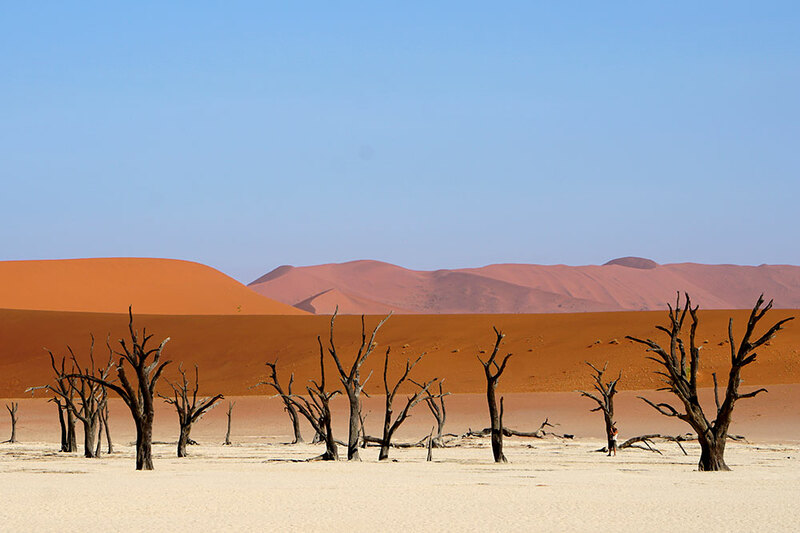 (This was the most crowded site we visited in Namibia, but even here, the tourists were dispersed enough to allow for peaceful contemplation.) 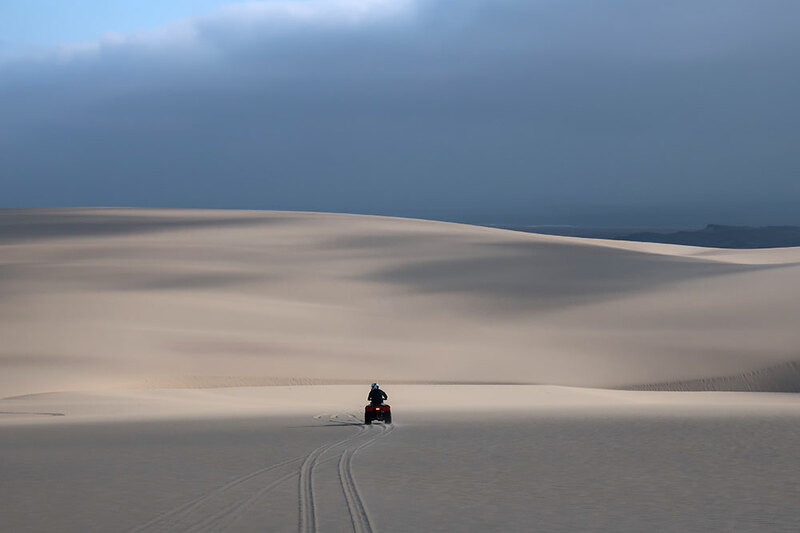 An ATV excursion across a flatter, rockier portion of the desert also proved memorable. Our night walk in the desert was disorganized, however. Six of us awaited our guide, who had told us to meet at 8:30 p.m. Staff approached one of the couples waiting for the walk to alert them that a private candlelit table had been set for them in the wine room. But it turned out the table wasn’t for them. And our guide didn’t appear until 9, just as we’d finally decided to sit down to dinner. In contrast to the other camps on this trip, the waitstaff were reserved. Indeed, they looked quite sour when the six of us decided to eat outside, which required them to move tables from the dining room to the terrace. Some dishes, such as kingklip (a kind of local whitefish) fillet with lemon butter and couscous, were satisfying. But I was unimpressed with the late lunch we received when we first arrived — a sandwich of processed cheese and deli meat — and with the burned pastries on the breakfast buffet. Other minor irritations, such as barely adequate air-conditioning and Wi-Fi that required a new code every 36 hours or so, compounded my general frustration. Little Kulala has style and sense of place, and its private entrance to the national park is a great asset. 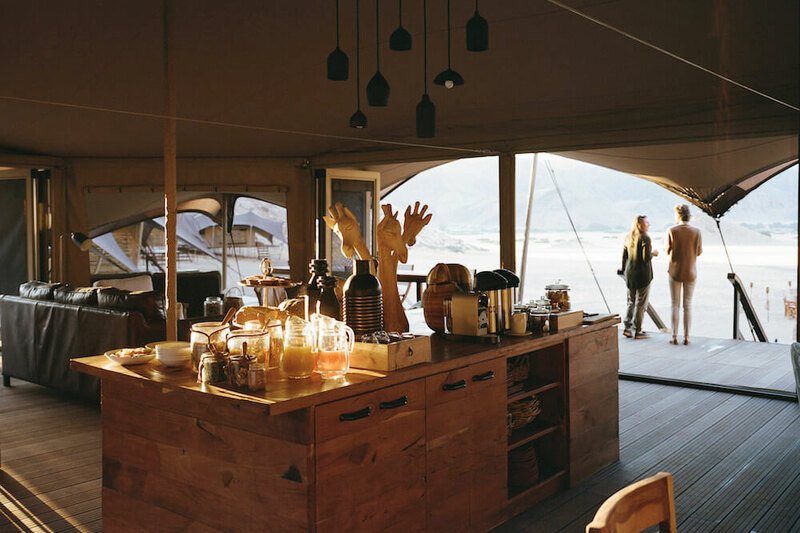 But new camps have raised the bar in Namibia, and travelers now have a rich selection of beautifully designed and impressively staffed lodges from which to choose. 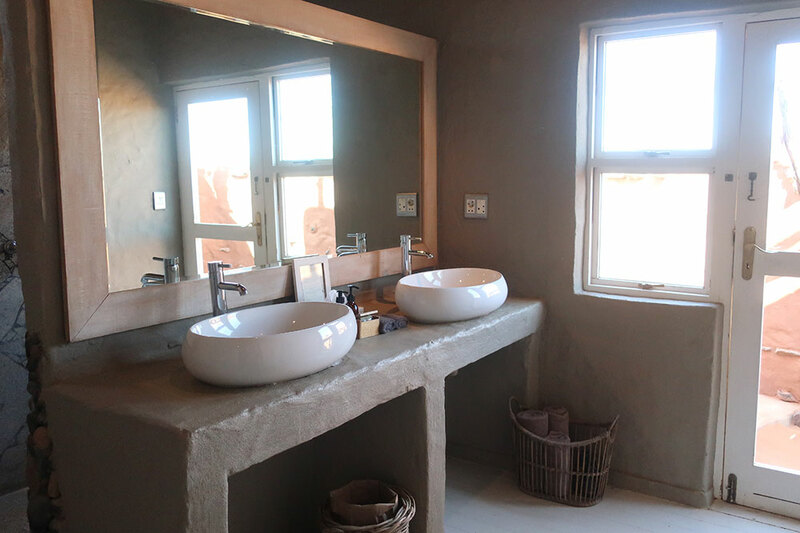 Older properties, such as &Beyond Sossusvlei Desert Lodge, are completing renovations as of this writing. Little Kulala will have to up its game to compete. 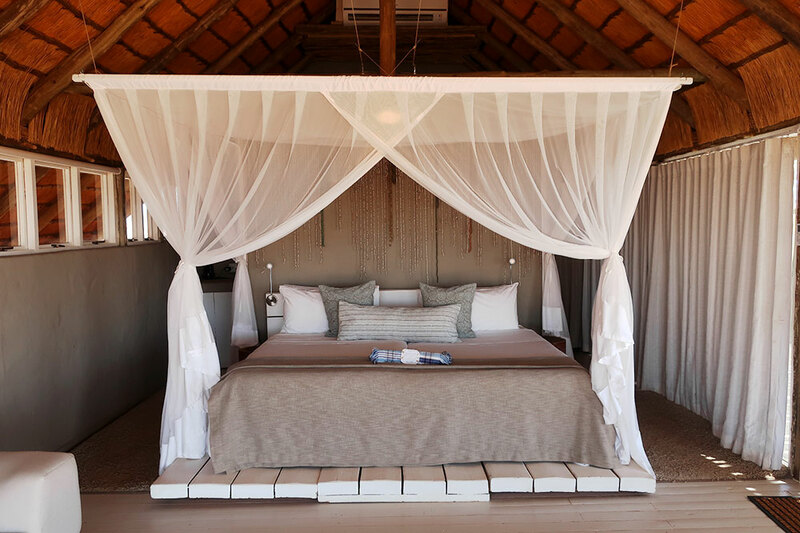 Our large terrace with its cool plunge pool; the striking design; our good-humored guide; the private national park entrance; the open-air “star beds” atop each villa. The restaurant service, which ranged from reserved to irritable; the inadequate air-conditioning; the occasional disorganization; the short duration of the Wi-Fi passwords. Hot air ballooning is unavailable from mid-January to mid-February.